After having a brief freak out about my Juno 106’s ‘hanging notes’, I thought something was wrong with the envelope section but with very little investigation, it seems like its something more common: a bad voice chip. 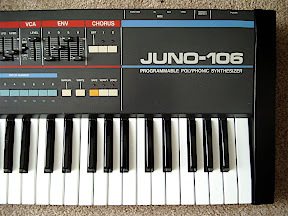 Apparently Juno 106’s blow their chips regularly/inevitably and this guy took the time to clone the Roland chips as they don’t make them anymore. Hes on the second generation of clones and they’re only 40 euros. Visit this guy as well if you want some additional information on the clones and replacement procedures. Also, if anyone has bought a space echo replacement tape loop from these guys or if you have any alternatives, let me know. seems like a few sites have their own spin on it, so if you know of something reliable, comment away. We stopped by a friends house who sold all his old gear for a killer Buchla system. New modules from Analog Haven. Installing the Doepfer A-188b and A-154. Also Justin’s old studio! Cwejman + Doepfer = geargasm. Props to anyone that can spot the Alesis Andromeda A6.